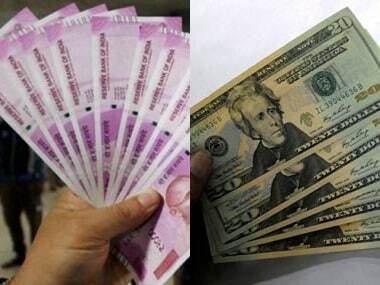 New Delhi: Rising for the second straight session, the rupee advanced 19 paise on Wednesday to close at 69.11 against the US dollar on strong foreign fund inflows amid the greenback's weakness against key rivals overseas. At the Interbank Foreign Exchange, the domestic unit opened at 69.26 and advanced to a high of 69.09. It finally settled at 69.11, showing a gain of 19 paise over its previous close. Forex dealers said selling of the American currency by exporters supported the rupee. Moreover, IMF's bullish growth outlook for the Indian economy added strength to the local currency. "Rupee bulls are having upper hand over American dollar amid expectation of inflows through Vodafone-Idea right issue (USD 4 billion), Baring's investment in NIIT ($400 million) and Essar Steel acquisition ($7 billion)," said V K Sharma, head PCG and capital markets strategy, HDFC Securities. Meanwhile, brent crude, the global oil benchmark, was trading at $70.92 per barrel, higher by 0.44 percent. The dollar index, which gauges the greenback's strength against a basket of six currencies, slipped 0.07 percent to 96.93. Foreign investors remained net buyers in the capital markets, putting in Rs 1,429.92 crore on Wednesday, provisional exchange data showed. Market benchmark BSE Sensex, however, lost 353.87 points, or 0.91 percent, to close at 38,585.35, while the broader NSE Nifty dropped 87.65 points, or 0.75 percent, to 11,584.30. The Financial Benchmark India Private Ltd (FBIL) set the reference rate for the rupee/dollar at 69.1482 and for rupee/euro at 77.9120. The reference rate for rupee/British pound was fixed at 90.3799 and for rupee/100 Japanese yen at 62.21.